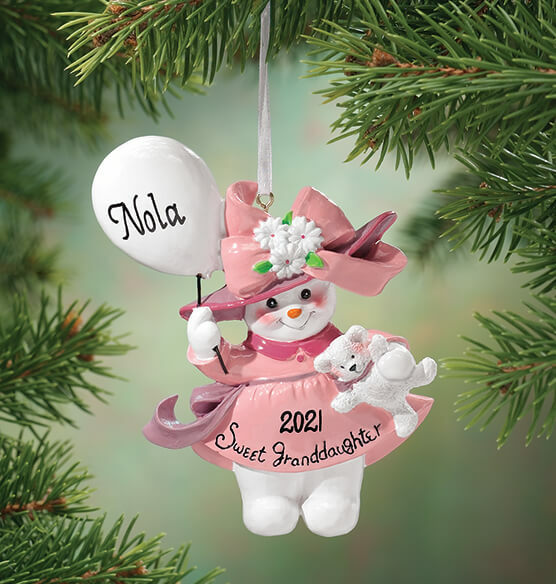 She’s your darling, your dearest, your perfect little princess… declare your love with a personalized granddaughter ornament honoring her! Resin. 3 1/4" long x 5/8" wide x 4 1/4" high. Specify name; limit 1 line, 8 letters/spaces. Specify year; limit 4 characters. We’ll handpaint any name on her balloon, with memorable year on her pretty pink skirt. This is a beautiful ornament. My granddaughter loves it on her Christmas tree. I bought this for my daughter who is now a Grandma (making me a Great-Grandma). She refers to Rylee as her little Princess; so, this will be perfect for her tree. It is beautiful and well-made. My grandaughters and their mothers loved this product. They were a real hit. This was the cutest granddaughter ornament that I have ever seen. I looked and looked and I finally found the one that was just perfect for her. It even looks like her with that little chubby face. I am sure when she is old enough she will treasure it. This is the perfect piece for my 19 month's start to her ornament collection. This ornament is sturdy and adorable. The personalized name is easy to read not like the metal oranments where they are engraved. Engraving on my previous ornaments can hardly be read. This is so much better! Thank you Miles Kimball! Gift for my sweet new grand-daughter. This ornament is very cute and well made. I hope my granddaughters think of me at Christmas when they put it on their tree for many years to come. Bought 2. Love, love this ornament. Loved the colors and quality. I hought this ornament for my granddaughter. Lovely Christmas ornament. I have the same one for my other two grandchildren and this makes the set complete. This product was so good. Just bought this product once and gave it to my sister for Christmas gift. She loved it so great. Very cute and unigue ornament. My Granddaughters 1st. I'll be back next year for more. Thanks-good product. Cuter than it appears in the catalog. A stocking stuffer gift. Very cute and the personalization is very nice. I bought these ornaments for my 2 granddaughters and it is adorable. I like how you can pick the year and name. Sometimes you can only pick the current year. I can't wait to hang it on our tree this year! I give my grandchildren a new Christmas ornament every year. My granddaughter was so excited to see her name on her ornament this year. She loved it! Big hit for Grandma! If you have a unique name and want to give an adorable personized gift this one is just what you are looking for. I liked the ornament. I'm sure it will look real nice on my Granddaughter's tree. I bought this to put on my tree. My grandaughter loves to see "her" ornaments on my tree. It is truly adorable. I was impressed that the adorable ornament looked cuter in person than on email. I shop for bargains and I am happy with the quality of this product. I used this ornament on our Christmas tree. My granddaughter really liked it, she is two and a half. very satisfied with quality of product, but it is a bit heavy to hang on a tree. Would suggest having them in different ethnic groups, as our family is a rainbow family. I gave this to my grandaughter for a Christmas gift.I was very pleased and would recomand it as a gift for any little one. This is a beautiful detailed ornament. I was pleasantly surprised by the level of detail and weight. It will be a lovely keepsake for many years to come and a wonderful gift idea. This beautiful ornament will look great on the Christmas tree for years to come. I plan on giving this to my grand daughter on her first xmas as a remembrance from grandma. It is adorable and better than some of those first ornaments being offered. My only beef was that the sweet grand daughter lettering was faint in spots and not consistent. Nice to get personalization as my granddaughter is named Moira and you don't find that ready made. Nicely made and well painted. My 5 year old granddaughter loved it! It was a gift for my granddaughter, age 5. Cute for Christmas, especially because the year is on it. The ornament is cute and I knew it would be heavy like all resin ornaments are, but I didn't expect the back to be completely flat like a plaque rather than be a 3-dimensional ornament. It's like the whole ornament was slice in half and you're only getting the front half. It takes away from how nice it would be. If it swings on the tree branch, it will look terrible. I ordered this ornament and the Sweet Grandson ornament. The first set I received my grandson's name was misspelled and the words on the Granddaughter ornament were smudged. They were replaced with no problems and quickly. The second set still had smudges and the letters were not solid. I had to finish them with a sharpie. Had high expectations for this ornament but it is very poorly made which is a shame! Name was also smeared. Little Pricey for what it is! Looked good in the magazine, but looked cheap and cheaply made when it arrived. Would NOT buy it again! !